America was built with boots. Leather and laces… or straps… or buckles… but the point remains. Boots are tough. Boots are solid. Boots are cool. This pull towards the classics that can be seen throughout every corner of the industry has not escaped Italian shoemaker TCX this fall season. The new TCX X-Blend WP Boots are subtle enough not to scream, “Hey, I rode here on a motorcycle… LOOK AT ME! LOOK AT ME! LOOK AT ME!” Yet they’re still stylish enough to let their presence be known. Built from a full grain vintage leather and reinforced throughout the ankle, heel, and toe, these are motorcycle boots that know how to play it cool. Durability is the key to these boots, as they make use of a highly wear-resistant rubber sole and are solidly built in every regard. 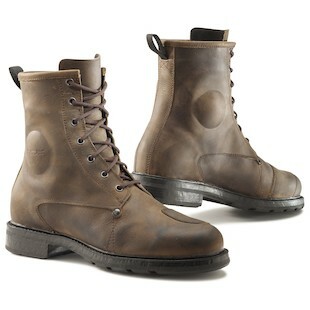 Minimal branding, plush interior, and a waterproof liner make this a boot for almost any motorcycling occasion. For a somewhat different look, the TCX X-Garage offers a less rugged, non-waterproof option. 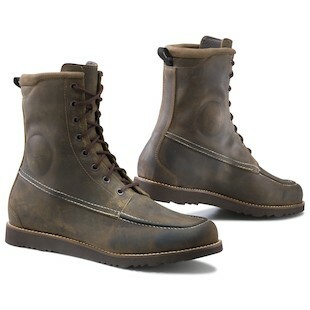 With a flatter sole that is more casual in design than the heavier X-Blend, this boot comes in a vintage brown leather with internal Air Mesh lining. As it does not have a waterproof liner, it will be slightly more breathable than the X-Blend, which works well for riders in more temperate climates. Boots are the best. Real boots. Ones whose well-worn leather carry with them life stories from the road. TCX aims to help that remain the case for a long time to come with the X Blend WP and X Garage boots. Have fun out there, be safe, and as always… enjoy the ride.